Ever Wanted to Watch Kurt Russell Smash an Antique Martin Guitar? For the music industry and especially guitar enthusiasts, Christmas 2015 was a smash hit. "We were informed that it was an accident on set. We assumed that a scaffolding or something fell on it. We understand that things happen, but at the same time we can’t take this lightly." Martin collectively seemed like they were going to be cool about the whole situation at first... until they found out what really happened. "You see, what had happened was..."
Quentin Tarantino released his next big movie on Christmas day, called the Hateful Eight. In this movie eight real tough cowboys, cops, criminals, and other Western types all cross paths in the worst of Winter during the Civil War. The whole crew basically gets locked up in this general store while a storm blows over. Jennifer Jason Leigh's character is a fugitive who's been captured by Kurt Russell. The entire time, she's literally connected to Russel at the wrist with a set of handcuffs. He's constantly smacking her around and all of this brutal stuff. Teeth are coming out and all kinds of crazy Mortal Kombat fatalities. But then she asks kindly to be unshackled so she can play and sing the Eight a little diddy on a guitar in the cabin. Kurt's like "Cool, we're bored, no harm, no foul." He releases her and she starts fingerpicking away. And that day, the Grinch's heart grew a little bit larger. The Martin Guitar Company, on the other hand, now has an icebox where their heart used to be. "Yeah... you know that 140 year old guitar you guys loaned us out of your museum? You guys are so cool for having done that. Really, great guys over at Martin. Anyhow, we kind of had an accident and banged up the guitar a little bit. I mean... it's pretty much done for. Thanks in advance for your understanding and forgiveness." I'm sure the Martin fellers were like "Well, what can you do? What's done is done and we don't cry over spilled milk. An accident in the name of art is one worth having." That was until they learned what really happened. 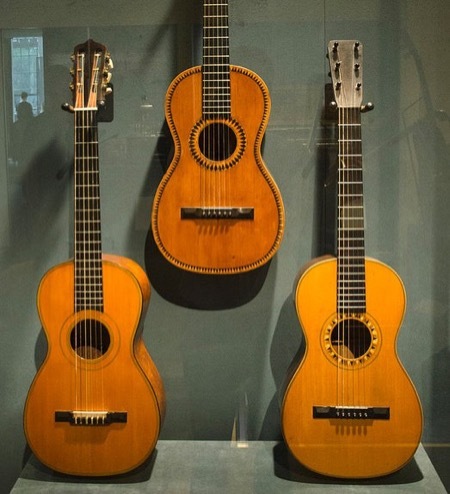 The actual historic Martin guitar as it was in their museum. "All this about the guitar being smashed being written into the script and that somebody just didn’t tell the actor, this is all new information to us. We didn’t know anything about the script or Kurt Russell not being told that it was a priceless, irreplaceable artifact from the Martin Museum ... I don’t think anything can really remedy this. We’ve been remunerated for the insurance value, but it’s not about the money. It’s about the preservation of American musical history and heritage." Boak has also stated that Martin will no longer loan out their historical artifacts from their museum, for any reason. 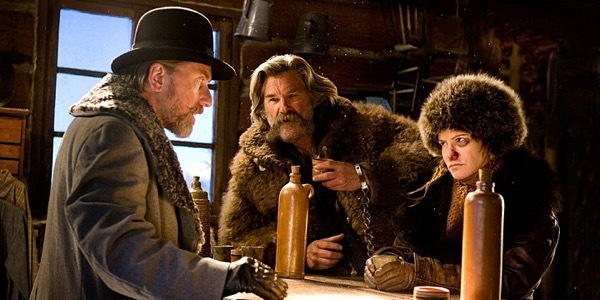 Nobody wants these kind of things to happen, but Tarantino's films always capture real moments of magic and include them in the final cut of the movie. Remember when Leonardo DiCaprio shatters that cup in Django Unchained and he gets this crazy look on his face as his hand starts bleeding? That was real. You know what else was real? 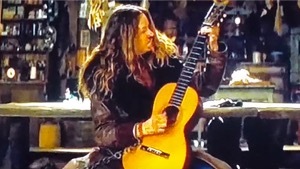 The best part of this entire ordeal, beyond the smashing of one of the oldest acoustic guitars left on the planet, is the look in Jennifer Jason Leigh's face as she watched Russell do the deed. "I hope they have some superglue in this cabin." If I was Martin, I'd get the pieces of the guitar back and put THAT in the museum as an exhibit.